The MAX4350 single and MAX4351 dual op amps are unity-gain-stable devices that combine high-speed performance with Rail-to-Rail outputs. Both devices operate from dual 5V supplies. The common-mode input voltage range extends to the negative power-supply rail. 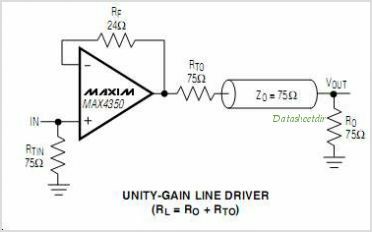 The MAX4350 MAX4351 require only 6.9mA of quiescent supply current per op amp while achieving a 210MHz -3dB bandwidth and a 485V/s slew rate. Both devices are excellent solutions in low-power systems that require wide bandwidth, such as Video Communications and instrumentation. The MAX4350 is available in an ultra-small 5-pin SC70 package and the MAX4351 is available in a space-saving 8-pin SOT23 package. This is one package pinout of MAX4350,If you need more pinouts please download MAX4350's pdf datasheet. 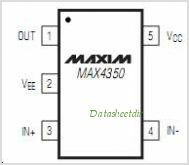 This is one application circuit of MAX4350,If you need more circuits,please download MAX4350's pdf datasheet.